Libertarian's Forum › Libertarian's Forum › Freedom Forum › How Many Weeks Until The President's Impeachment? It seems the President is on the fast-track for impeachment. Congressional Left-Wing UniParty hacks are hell-bent on getting Trump in front of a Congressional Impeachment Committee. Maxine Waters, Rob Reiner, Rachael Maddow, Chucky Schumer, et al are clamoring for impeachment. President Donald Trump knew for weeks that national security adviser Michael Flynn had misled the White House about his contacts with Russia but did not immediately force him out, an administration spokesman said on Tuesday. Trump was informed in late January that Flynn had not told Vice President Mike Pence the whole truth about conversations he had before Trump took office with Russia's ambassador to the United States, White House spokesman Sean Spicer said. Re: How Many Weeks Until The President's Impeachment? I like that nice Vice-President. He actually impressed me in the debates, especially juxtaposed with that awful Kaine fellow. 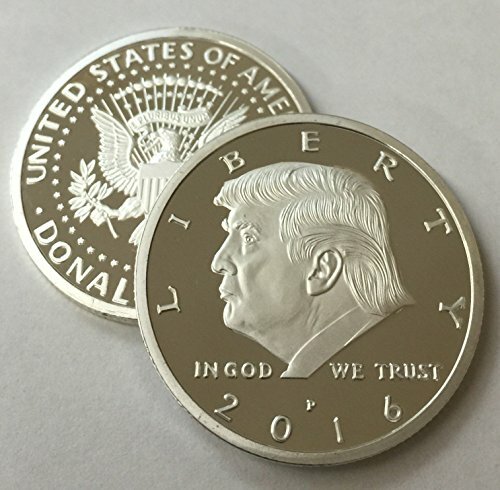 Here's the real question: Will I be able to collect a Trump commemorative presidential $1 coin, or will he be out too quickly to be included in the set? Can Obama be impeached retroactively? There's no need to impeach a former president as they can be tried the normal way. Trump's impeach will start as soon as the GOP leadership is confident that their base is disenfranchised with Trump. When the recession is underway, they'll impeach. They may also impeach if he does something that can't be ignored, like ignoring a supreme court decision against the administration. Here is one of many .999 Silver 1-ounce Commemorative presidential $1 coins available. These are NOT minted by the U.S. Mint. There are various independent mints that offer these - and coins of similar design featuring the Trump head on one side and a Make America Great Again sloban on the other side. I was tempted to buy some of these coins, but the premium was nearly double the silver content value - a coin with $17 worth of silver was fetching $33 to $35. After Trump gets impeached, these coins will be worth $17 again and I might buy some. I don't know, they're pretty funny. I could see the price going up if he gets impeached. Maybe he'll just do what FDR did and threaten to appoint a few more Supreme Court Justices who will vote with him? I've still got a can of Billy Beer. It didn't get more valuable when Slick Willie Clinton got impeached. Wasn't Billy beer from Carter's brother? They just gave him free Billy Beer so he would let them call their beer "Billy Beer". Everybody was happy except the people that bought Billy Beer.